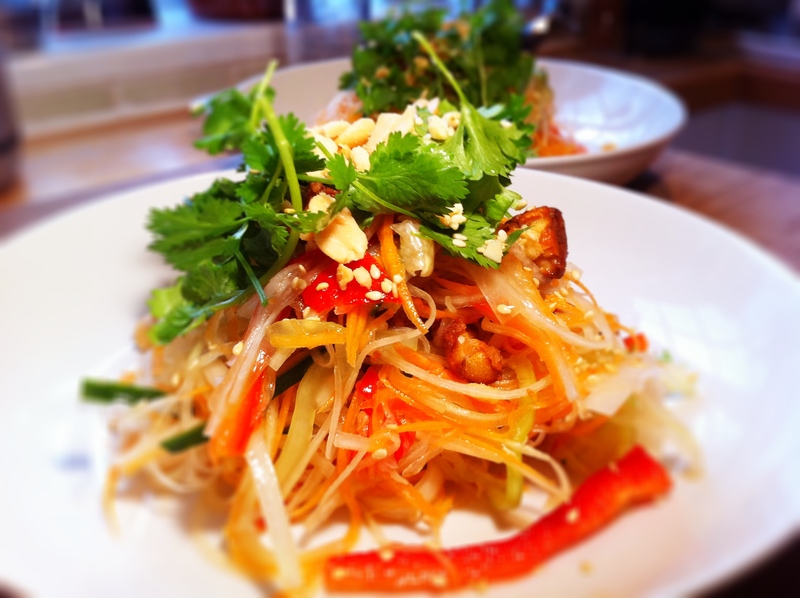 Red chillies and green papaya. Look great together, taste even better! It’s been a happy, happy few days for the bigfatnoodle and the bigmonster. 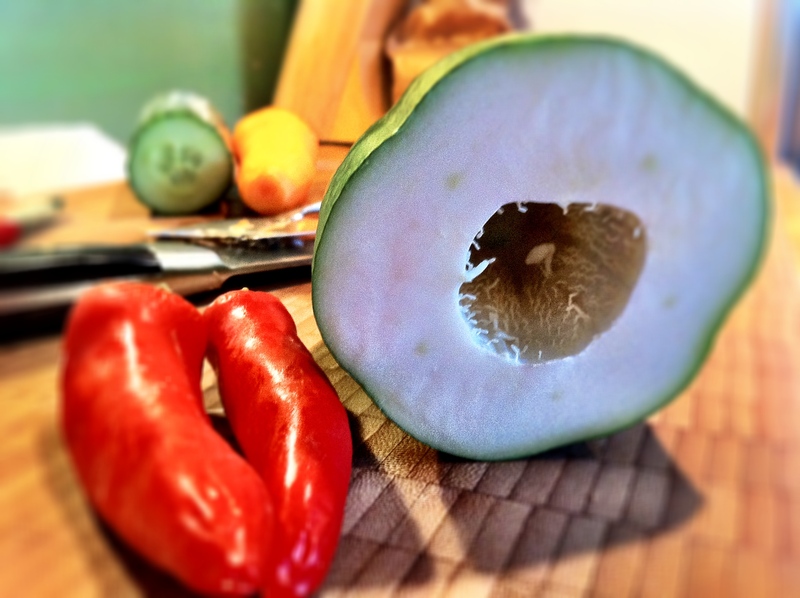 Our local Thai grocery store in Guildford has started selling fresh green papaya, yippeeee! The timing couldn’t be more perfect. I freely admit it; the last few weeks of thebigfatnoodle have been a teeny bit of food fest. Our livers, not to mention our arteries, have been screaming for a break. So, it’s time for us to turn down the calories but seriously crank up the flavour. For me, that means turning up the heat too! It's all about the crunch! 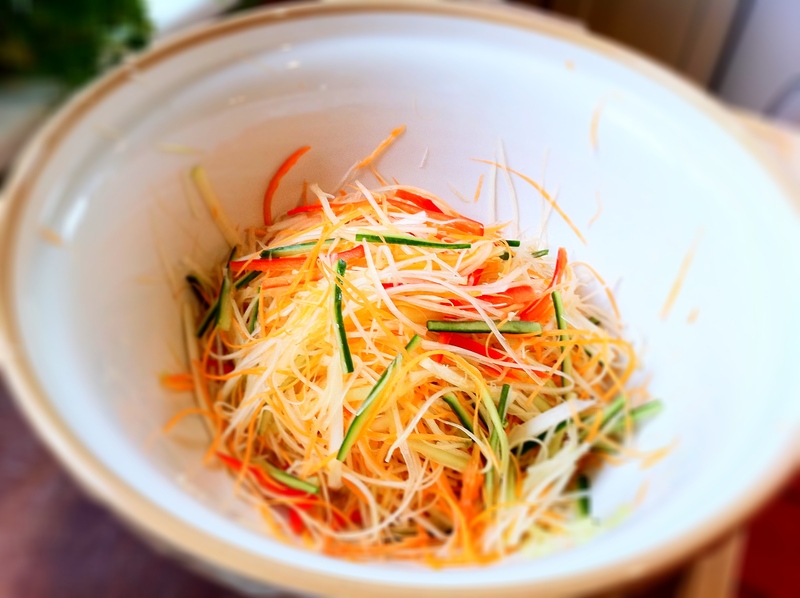 The reappearance of green papaya in our lives (let me repeat that, yippeeee!) 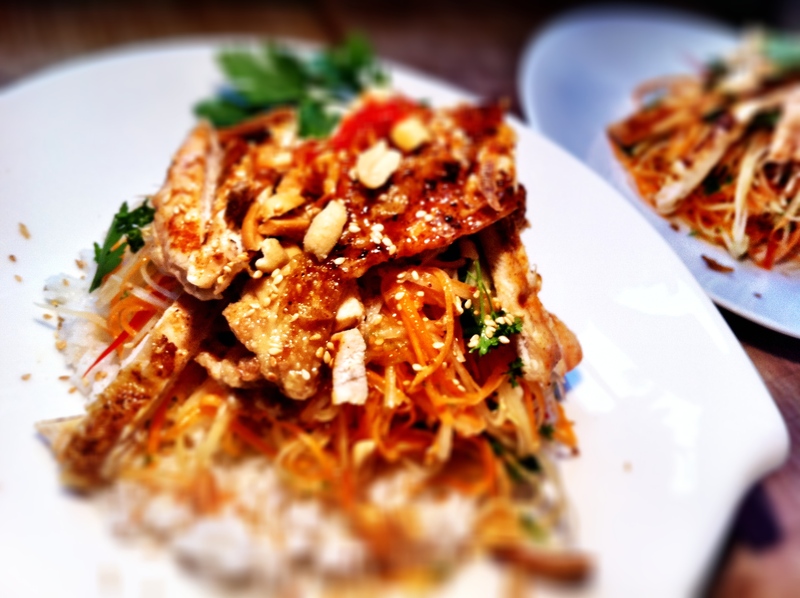 means we can make one of our all-time favourite salads in the world, Thai sum tom. Everything about this salad has bite, which is what I love about it. 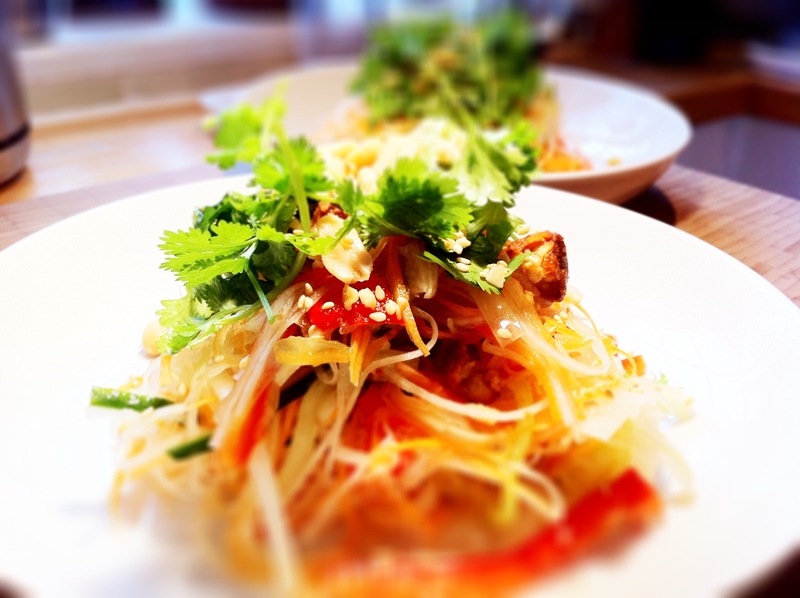 Crisp, crunchy vegetables drenched in a blindingly hot, sweet and sour dressing. It doesn’t just pack a punch; it verily explodes in your mouth to make sure you know it’s there! Out of all the salads in the world, this is seriously the one we could probably eat day in, day out. I just never seem to get bored of it. We’re already on our second papaya, having eaten this salad four times in the last 10 days alone. Bit of a problem since I think you’ll get bored fast if I just keep posting different photos of the same salad every other day. If you’re still not too sure about trying this salad, let me just say this. Not only is it yummy, it’s virtually fat free. VIRTUALLY. FAT.FREE. Excluding the fried tempeh I chose to add in the recipe for the blog, the dressing uses NO OIL, and limes are supposedly good for their fat burning qualities. So, I’ve shown both a vegan version which features fried tempeh as well as a version which includes grilled chicken (again, a healthier way of cooking…). I really hope you’ll give this a go because it’s just seriously one of the best dishes in the world. The healthiness of it is just an added bonus. Oh wow this look really really yum. Never made it, but it looks delicious an wonderfully light! I have some green papayas on a tree in my garden. How do I know at what stage I should pick them to use in the salad? Oh dear, I have absolutely no idea! I always buy them from the shop so assume they’re ready to eat. They grow everywhere in Singapore but I’ve never picked one myself.